The Kosciuszko Bridge carries the Brooklyn-Queens Expressway over Newtown Creek from Maspeth to Greenpoint, Brooklyn, and connects to the Long Island Expressway on the Queens side. More than 170,000 vehicles are using it daily. 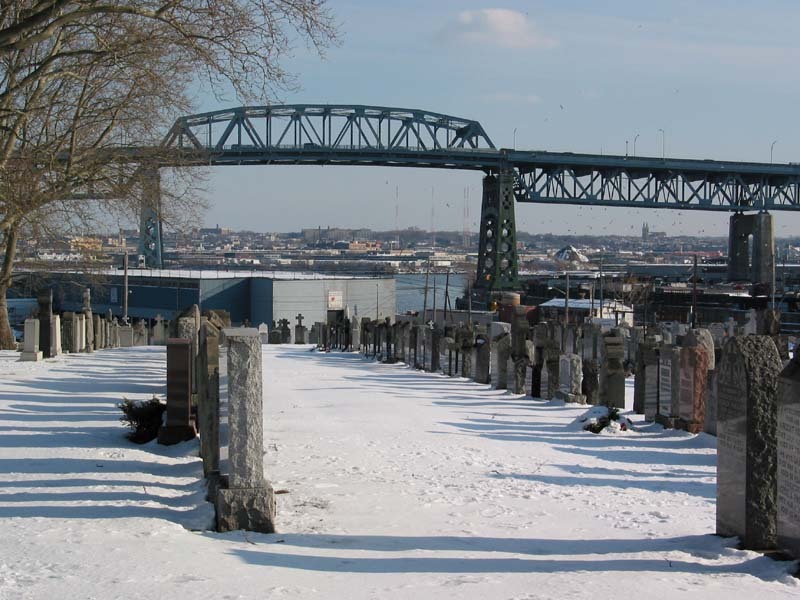 The view of Kosciuszko Bridge from the Calvary Cemetery in Queens. The view of the Kosciuszko Bridge from the Grand Street Bridge. It might be replaced, which would be too bad. The Kosciusko Bridge Poject is moving through the EIS process. There were originally 26 (26!) alternatives, which included two low spans over the creek, one a fixed span which would include filling in the creek. The number of options has been reduced to 12. Both low bridge plans have been eliminated, and one tunnel option remains. haddeus Kosciuszko, a native Pole who came to America in 1776, befriended Thomas Jefferson and fought for the colonies in the Revolutionary War, distinguished himself in his adopted homeland as an engineer. Nevertheless, for most New York City commuters and drive-time radio listeners, Kosciuszko's name signals one thing: gridlock. His namesake, the Kosciuszko Bridge, has spanned Newtown Creek, between Greenpoint, Brooklyn, and West Maspeth, Queens, since 1939, and recent years have not been kind. The bridge, with its narrow, shoulderless lanes and its steep arch designed to accommodate high-masted ships, has devolved into a perpetual traffic bottleneck for the 170,000 drivers who cross it on the Brooklyn-Queens Expressway every day. But the State Department of Transportation, aided by a committee of local representatives and neighborhood members, is working on a solution that it hopes would make Kosciuszko (pronounced ka-SHUSH-ko or ka-SHUSH-ka) proud. The agency has been studying an overhaul of the bridge since 2002, and construction would likely not start until 2009, but discussions are at a critical juncture: some 30 proposals have been narrowed to five, which involve either adding lanes on a parallel span or tearing down the existing bridge and starting over. Teresa Toro, who lives in Greenpoint and represents the Tri-State Transportation Campaign on the steering committee, says more neighbors should get involved, since the project may drastically affect the area. "Depending on the alternative, it could be taking over a business, it could be closing a street," Ms. Toro said. "The whole bridge is really badly designed, so it's going to require a significant overhaul." Much of the area is industrial, but there are swaths of two-, three- and four-family houses nearby, particularly on the Brooklyn side. Mary Gottlieb, a committee member whose house on Meeker Avenue has been in her family since 1918, said the talks with officials were going smoothly, but added: "Under no circumstances are we going to let even one of our homes be taken for this project. Traffic is very important, but I'm sorry to tell you this: Communities are more important." For its part, the Transportation Department is concerned with improving traffic flow and keeping trucks off nearby residential streets, said Lisa Kuhner, a spokeswoman. Whichever option is chosen, work could include adding shoulders, expanding entrance ramps and lowering the bridge's 125-foot height. One thing about the overhaul is certain, Ms. Kuhner said: Whatever happens, Kosciuszko's name will remain. The Kosciuszko Bridge was the best wrong turn we have ever made in our lives!! We're in love! 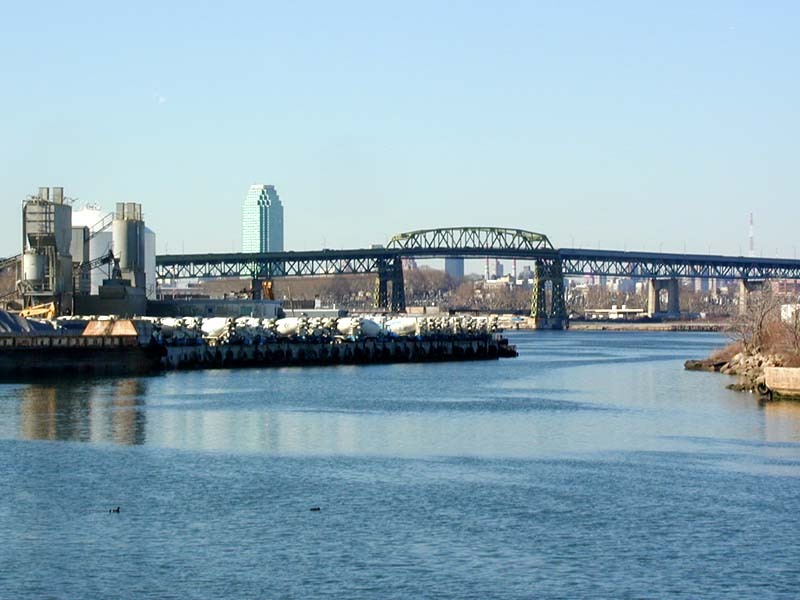 The State Department of Transportation will hold two public meetings this month to discuss the update plans for the renovation or replacement of the Kosciusko Bridge, which spans Newtown Creek, connecting Queens with Brooklyn. For the last four years the DOT and the Federal Highway Administration have studied a range of 26 plans that ran the gamut from doing nothing to widening the existing bridge to rebuilding and even replacing the whole thing with a tunnel. This week the agencies released the Draft Environmental Impact Statement on the plan, and have narrowed the field to six choices: the first is a no-build option, which would require major work to be done in six years; the next two plans would each widen the existing bridge, take just under four years, cost $559 million or $515 million, and add a total of three lanes of traffic; and the final three options would replace the bridge entirely, take five to six years to complete, cost between $630 million and $712 million and also add three lanes of traffic. The Department of Transportation has pulled out all the stops with the Kosciusko Bridge project. The aging bridge – a six-lane, 1.1- mile, tightly-packed overpass that joins the B and Q on the BQE – has been plagued with maintenance problems for years and badly needs to be replaced or repaired, according to transportation officials. Opened in 1939, the bridge was named after Taduesz Kosciusko, a Polish general in the American Revolutionary War. The two bridge towers are mounted with eagles, one a Polish Eagle and the other an American Eagle. Officials began a public scoping process in 2002, meeting with local officials and residents to determine the important social, economic and environmental considerations involved in the project. A final EIS will then be issued later in the year, shortly after which the DOT will announce which proposal it ultimately selected. No actual construction will begin on the project until 2011, according to the DOT Web site. In the interim period, the agency is conducting a $12 million rehabilitation of the bridges superstructure and deck. The public hearings are scheduled for Thursday, April 19, at the Polish National Home, 261 Driggs Ave. in Greenpoint, from 11 a.m. to 9 p.m. The Queens public hearing will be held Thursday, April 26, at the DeVry Institute of Technology, 30-20 Thomson Ave., Room 301, in Long Island City from 11 a.m. to 9 p.m. The open house will begin at 10 a.m. Copies of the plan are available online at www.nysdot.gov, and are also available in the Maspeth and Sunnyside branches of the Queens Library, the Queens Borough President’s office and the offices of Community Boards 2 and 5. This plan to renovate should include a pedestrian promenade of some sort because it has bar-none the best north-south east views of NYC. You can see all of NYC's skyline components; Brooklyn's downtown and Williamsburg savings bank tower, the east river bridges, Downtown, part of the Jersey City skyline, Midtown, UES, Uptown and the Budding Queens skyline. Just incredible views. ^ That's one of the reasons why I think they should just repair it instead doing some, devoid of character modern replacement or worst, a dumb tunnel. Just look at the pictures by Edward above. Imagine how less interesting that scene would be without the bridge. This plan to renovate should include a pedestrian promenade of some sort because it has bar-none the best north-south east views of NYC. There is no tunnel option. All options except the no-build and RA-6 include a pedestrian walkway. And that is just one quarter of the whole view! A state agency has lifted a puzzling bureaucratic roadblock that significantly delayed a long-awaited plan to replace the traffic-choked Kosciuszko Bridge. The Historic Preservation Office last week abandoned its push to preserve the deteriorating bridge, thus ending an inter-agency squabble that delayed final approval of the project by at least six months, the Daily News confirmed Wednesday. The state Transportation Department had originally anticipated receiving federal authorization for the roughly $700 million project - the final regulatory hurdle - by the end of last year. However, as The News first reported last month, the DOT was forced to shelve the project last November after Historic Preservation objected to final design plans that call for the Kosciuszko to be demolished and replaced by two new parallel bridges. Preservation officials deemed the aging span "a significant and unusual variation of the Warren truss type bridge" and argued that a rehab was "a prudent and feasible alternative to demolition," according to a letter obtained by The News. In response, DOT officials presented Historic Preservation with a report justifying replacement of the 1939 bridge, which carries the Brooklyn-Queens Expressway over Newtown Creek between Maspeth, Queens, and Greenpoint, Brooklyn. The report addressed safety concerns, such as its steep grade and substandard merging lanes - factors responsible for bottlenecked traffic and a high accident rate, according to the DOT. In a written response on Friday, Historic Preservation officials threw in the towel. "We concur that there are no prudent and feasible alternatives to the demolition of this historic bridge," an official wrote. "We find that correction of many of the substandard safety features would significantly alter character-defining features of the bridge." DOT spokesman Adam Levine said final design plans will be published in May, triggering a 30-day public comment period and a decision on final authorization, expected from the federal government in midsummer. Those with a stake in the project called the hangup pointless. "We had an unnecessary delay in this project," said Christine Holowacz, co-chairwoman of the Greenpoint Waterfront Association for Parks and Planning. George Kosser, vice president of Karp Associates, a Maspeth company whose plant will be acquired through eminent domain to make way for the project, said the holdup left him in limbo - and blocked him from negotiating for new sites for the business. "It kept the sword hanging in midair without giving me the date when it is going to drop," Kosser said. THE industrial slivers of northern Brooklyn and western Queens that sit in the shadow of the Kosciuszko Bridge are, to most New Yorkers, forsaken territory. A welder at Karp Associates, a company that will move to make way for a redo of the Kosciuszko Bridge. But on these hinterlands near the Kosciuszko, the aging bridge that connects Greenpoint, Brooklyn, to Maspeth, Queens, along the Brooklyn-Queens Expressway over Newtown Creek, is a thriving commercial ecosystem. It is inhabited by freight trucks that come and go, a scrap metal yard, wholesale distributors of flowers and Bangladeshi foods and a factory that produces steel doors. Several of the businesses there will soon have to move to make way for the new Kosciuszko Bridge. Last month, after years of planning and delays, the Federal Highway Administration signed off on a final design to replace the six-lane bridge. The new nine-lane bridge will consist of two eastbound spans and one westbound span, and it will include a bike path and a walkway. Construction is planned to begin in 2013. Given the Kosciuszko’s worn condition, plans to redo the bridge have generally been greeted as good news. The narrow span, built in 1939, has difficulty carrying the expressway’s unrelenting traffic, and frequent bottlenecks occur. Even so, many business owners are nervous about the future. “Surviving the move, that’s all we’re worried about,” said George Kosser, vice president for operations at Karp Associates, which manufactures small steel doors that are fitted within building walls to allow access to internal plumbing or electrical wiring. The factory, which employs nearly 100 people, has sat almost directly underneath the Kosciuszko on the Maspeth side for a little more than half a century. “We are the Cadillac of access doors,” Mr. Kosser said. Karp will be forced off its property by the government’s use of eminent domain, and the company expects to receive an offer from the state for its land and equipment within the next few weeks. The price should be “fair enough,” said Mr. Kosser, to allow Karp to open a new factory nearby before it must close the doors of the existing one. Among the few homes in the path of the new bridge is a dark blue house occupied by Tes Choudri, his wife, Sylvia, and their 4-year-old son, Toren. Mr. Choudri’s two sisters and parents live in two houses next door, and all are awaiting offers on the properties. Mr. Choudri, a 44-year-old accountant, remembers a time more than a decade ago when the area had more homes and far fewer businesses. “We are the last of the Mohicans,” he said. But he, too, recognized the need for the new bridge, adding that he often hears the bridge groaning when trucks cross. “That bridge is making a lot of noises it wasn’t making before,” he said.